Short of time? Need a super delicious fast easy recipe that everyone will love? I’ve been making this microwave baked potato for about 20 years now and it is still one of my favourites. Although I love baking a potato in its jacket, I am sometimes simply too busy. 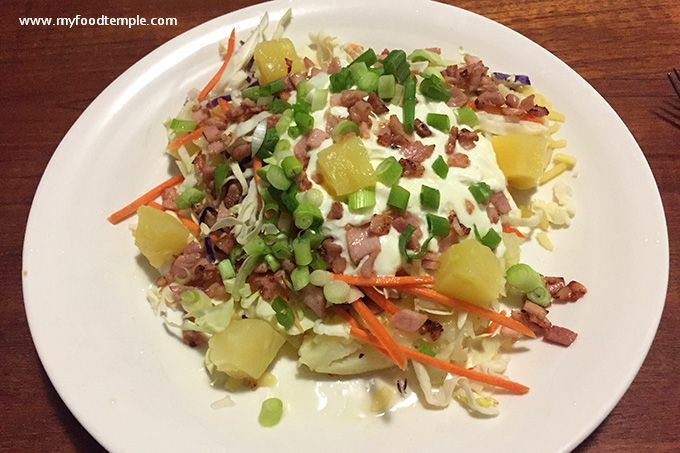 I often only have 10-20 minutes to prepare and cook a meal, so this recipe is essentially a baked potato hack for the busy person who still wants a tasty meal. I know many people use sour cream, but I use Greek Yoghurt (the full flavoured full fat natural version). Why? Because it tastes great and it is so much better for you than sour cream and it doesn’t give me bad asthma like a lot of sour cream does. The great thing about this baked potato is that you can tailor the topping to suit your own taste. This recipe is one of my absolute favourites though. The pineapple adds zing and sweetness and really makes it pop. It works perfectly with all the other ingredients.